The author will award a $50 Amazon/BN.com gift card to one randomly chosen winner via rafflecopter during the tour. Everybody has the awesome opportunity to find their own strength and path through life. Some come about their self-discoveries through studying and working hard. Others (Chelsea) spend their time nearly burning down kitchens and driving around the country with a car full of hangers. Chelsea grew up wanting to be “strong.” She thought arguing her way through childhood and becoming a world-class attorney would get her there. But, through a series of humorous, and only slightly embarrassing events, Chelsea comes to realize that maybe her strength is meant to shine in different ways. “FTL’s biggest client was a fabric design company that made nothing but Hawaiian prints. I’m actually pretty sure they no longer make anything, but rather spend good chunks of their time suing other companies who copy their designs. For me, it meant perusing catalogues and clothing websites in search of items with designs similar to this company’s retired fabrics. How great a job is that, by the way? I was getting paid to look for shirts with palm trees and hibiscus flowers on them. This whole law thing was too good to be true. My best assignment came when FTL caught wind that a men’s underwear line was infringing on our client’s design name. She came by and dropped a stack of male lingerie catalogues (yes, they exist) on my desk to go through in search of this name. I spent the better part of a week looking at pictures at mostly-naked men with socks stuffed in their skivvies. Chelsea was once obsessed with cats, longed to live in a big city, didn’t think she would ever have children, and aspired to be an attorney. She now lives in Boulder, Colorado as a stay-at-home mom and comedic writer with her husband and three daughters. She has no current plans to own a cat. Book links: The book will be $0.99 during the tour. I have had quite a number of jobs in several different fields over the years. That means I’ve participated in a lot of job interviews. At almost every one of them, the hiring person told me the company or department was busy. Very busy. Almost without exception, when I took the job I soon found that was just not true. At least for me. I was soon able to complete all the work I had to do with plenty of time left over. At one job, I surreptitiously wrote most of a romance novel. At another, I wrote a nonfiction book. At a third, I took several online classes. Now, I am quite organized by nature, but surely I’m not the only one with that quality. I’ve often wondered why most of the women I’ve met claim they don’t have enough time. 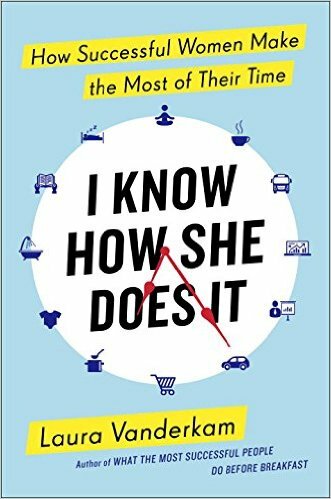 Laura Vanderkam’s book I Know How She Does It: How Successful Women Make the Most of Their Time gave me some insights. As I suspected, most people overestimate how much time they work by quite a bit. Vanderkam collected hour-by-hour time logs from women who earned at least $100,000 a year. Presumably, these women had more flexibility in their schedules than women with a more average wage. Each of them had at least one child under 18 living at home; however, their high earnings afforded them more child care options. The author based her conclusions on logs of one week from 143 women for a total of 1001 days. She calls the results The Mosaic Project. Each hour in a 168 hour week is a tile in that mosaic. What Vanderkam discovered is that the day to day totals don’t matter as much as the weekly totals. These women worked an average of 44 hours a week. Women at lower salaries average 35 hours a week. That left many remaining hours where the women were able to fit in family time, leisure activities, exercise, and even quite sufficient amounts of sleep. Vanderkam describes a number of strategies the women used and adds some advice of her own. Some delegation is helpful. Family breakfasts count just as much as family dinners. Planning ahead for contingencies is vital. Too much TV is just a waste. Sometimes good enough is good enough. That balancing act is not as hard as people say after all. When I spotted Carla Birnberg and Roni Noone’s small book on the shelf, the first thing I noticed was the endorsement on the cover by Venus Williams, ”Simple, powerful, real.” Who doesn’t want that in a book, right? 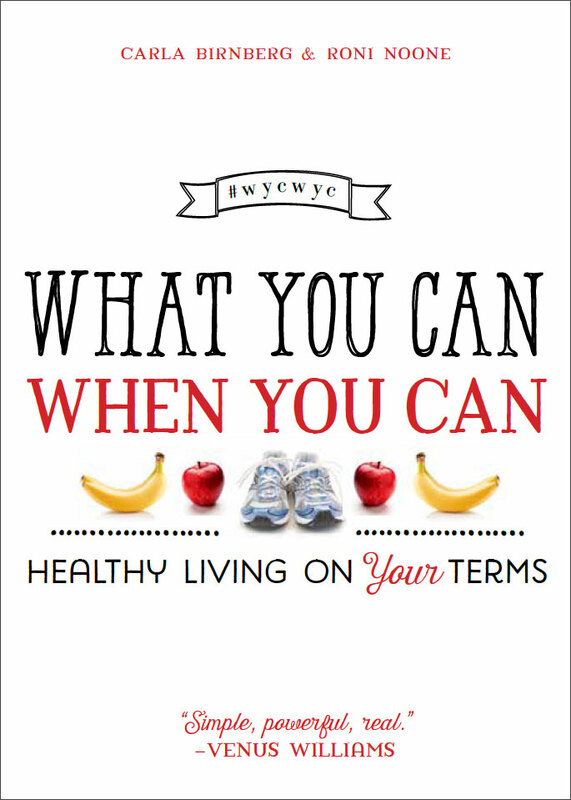 What You Can, When You Can: Healthy Living on Your Terms puts forth an encouraging philosophy. Do your best but compromise if necessary. The two women started blogging and have built up a community through social media. People can tap into this community to offer support and suggestions. The authors start out urging readers to adopt a new mindset, that being perfect is an illusion. You start out with the best intentions; than life happens. What do you do next? You take baby steps, of course. Have persistence, but be flexible. And, by the way, doing things for yourself is not selfish. Set boundaries and learn to say no. Reframe negatives into positives. Change “must do” to “choose to do.” If something really doesn’t work for you, quit doing it. Ask for help if you need it. I’ve heard it before, but it bears repeating. We are the sum of the people we spend the most time with. Choose your friends wisely. Don’t be afraid to try new things. Be more active even if it’s inconvenient. In fact, embrace inconvenience. Take the stairs; park far from the store. Play! There are many more common sense ideas packed within the covers, but you get the idea. Life is for living, and little things add up. Venus Williams spoke the truth. 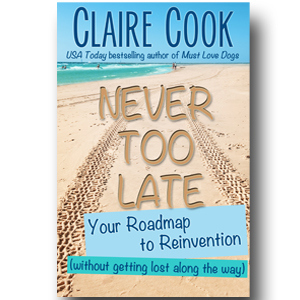 I have been wanting to read Claire Cook‘s Never Too Late for some time. It is an extremely helpful manual for mid-life women or anyone else who wants or needs to go in a new direction. It’s also full of interesting stories of how her first novel Must Love Dogs became a movie ans what it was like to go to Hollywood. Cook became an author at age 45 after teaching school for many years, so she knows whereof she speaks. Her advice about completing two pages of writing each day, no matter what, really hit home. So were the stories of how she came to re-acquire rights to her backlist books. It seems the life of a bestselling author is as rosy as it looks from the outside. The pages are full of many practical, common sense tips delivered as if by a BFF. Particularly appropriate for author wannabes, but applicable to many other life goals too.